The expansion starts off with the sith warrior having a terrrrible vision. Everyone is dead! Your whole crew is dead! Except it’s hard to take a vision like that seriously when Quinn is keeled over in a purple monstrosity. Plus it’s Quinn. Seeing him dead in any outfit is a bonus. Except the whole me-dead-too part. After which, I found it difficult to pay attention to information received from diseased Quinn (in hawtpants) as he gave me background information on the mission. 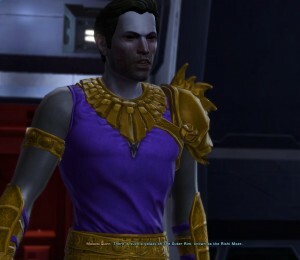 I cannot wait until we can dress our companions in whatever we want without worrying about stats. 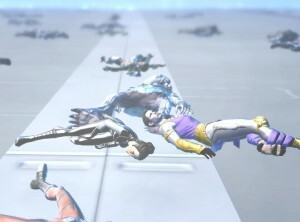 I was unwilling to spend the money to rip mods just so I could parade diseased boy around planetside. I should look into something truly awful for Quinn to wear. And most of my other idiots. The large majority of them drive me batshit insane. Yes, the changes for stats can’t come soon enough!